My first foray into “Cooler Than Your Average Cakes”, was my son’s first birthday. I set a bar for myself to try new ideas and cake decorating techniques each year my son got older! This cake was no great feat, as it used as many shortcuts as possible! But, it was stress free, and I cannot say that about most of the cakes that followed! So cute! But an easy cake to start with! As a single mom trying to plan a fun filled party with lots of toddlers and adults, as much as I wanted a cool cake, I did not have the time to learn-to-do-by-doing! So, every part of it was store bought! The Square Cake Base – I did not have a square cake pan, so I purchased this cake from the grocery store. I requested an un-decorated cake. Can you believe they charged me the same as a decorated cake! I didn’t even want icing! That was a waste of money! But the cake was perfectly square and flat, so I was satisfied. 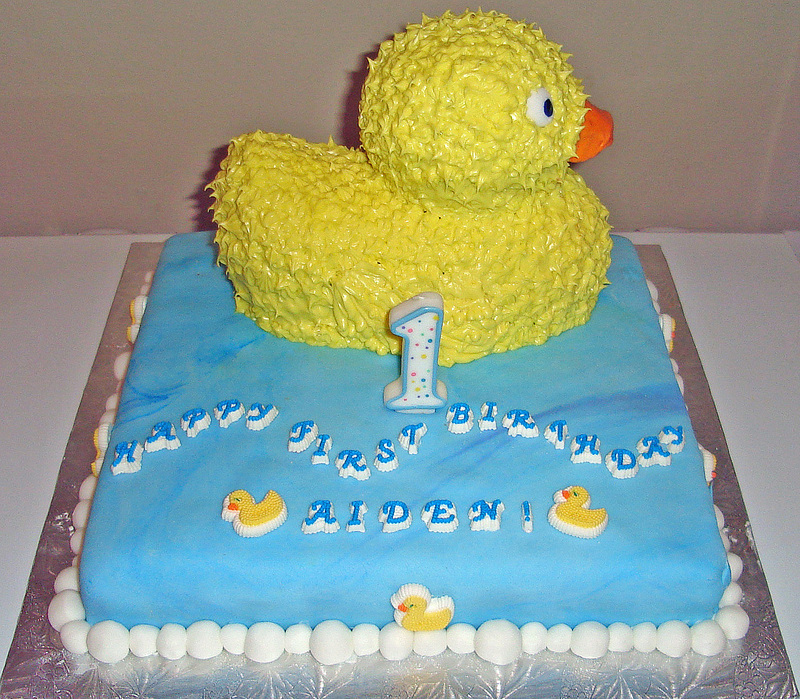 Ducky Cake – I purchased this ducky pan, and just used boxed cake mix. The Fondant – Satin Ice from the Bulk Barn… to this day my favourite store bought fondant. Now Bulk Barn sells Virgin Ice, which I also like, but I can order Satin Ice online still. I find that the Wilton Brand fondant looks beautiful on wedding cakes and holds up to all weather, but tastes like sugar coated cardboard! Virgin Ice and Satin Ice both perform AND taste great! The Icing – Vanilla Betty Crocker Tub icing. WAY too soft for the stars on the ducky! But it still worked out. 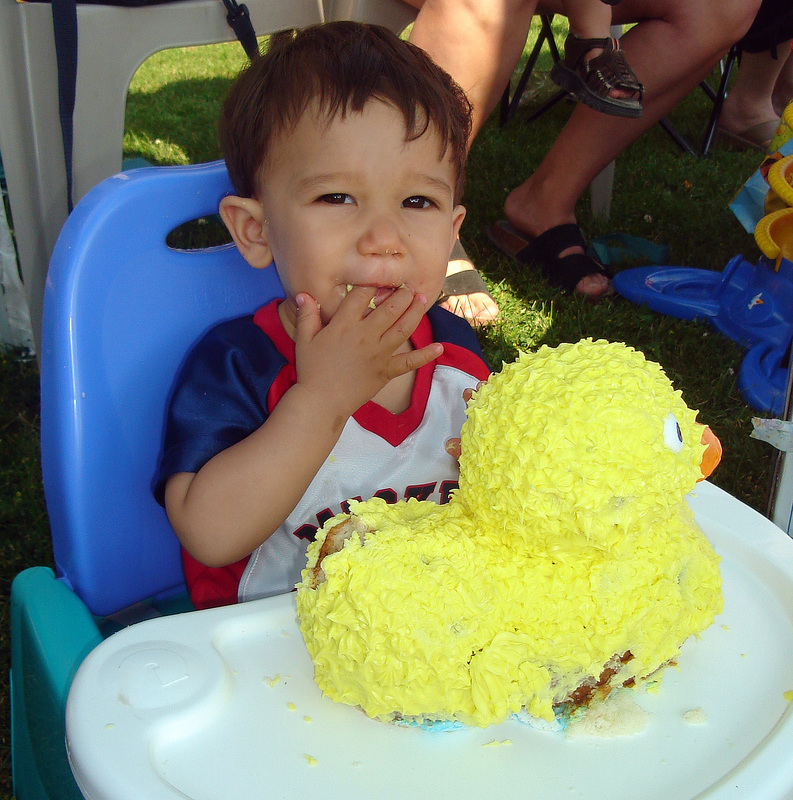 This was before the Bulk Barn sold Buttercream Icing, which I have used since. Though it can get expensive, and doesn’t taste quite as lovely as my new favourite Buttercream Icing Recipe. The Lettering and Little Duckies – Bulk Barn pre-created decorations! I knew that if I didn’t mix the colouring with the fondant all the way, it gave a cool marble affect, so I thought it would look a bit like water. I liked the visual texture it gave, as it is a very simple cake. This low square cake was such a great cake to learn how to cover a cake with fondant. I used an extra long rolling pin, an icing spatula, and icing sugar to roll it out. I did not colour all of the fondant blue… I saved some for the “bubbles” around the base! Before I rolled out the fondant I prepped the cake by “crumb coating” it with Vanilla Betty Crocker Tub Icing. 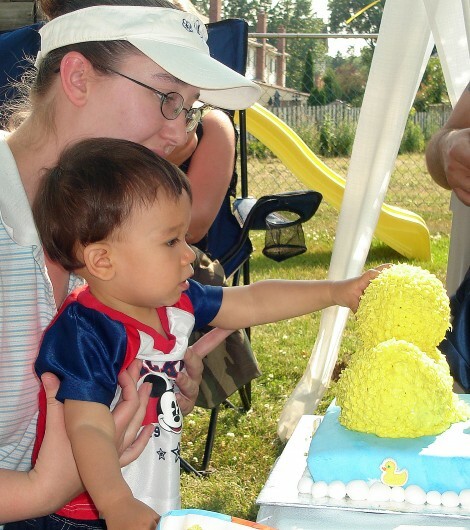 I used this ducky cake pan for the ducky, and using the star tip, covered him with yellow stars. I smoothed on the orange duck bill, and the eyes are fondant with black gel food colouring painted on. 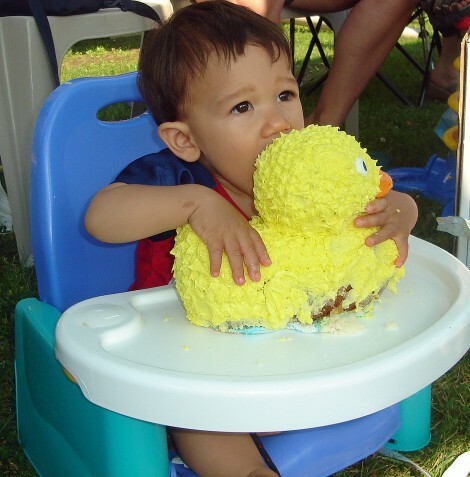 I really wanted to have it be a two part cake; the top for my Son to touch, taste, and devour, as is the new tradition of first birthdays. And a base to cut up for everyone else. It worked out wonderfully! 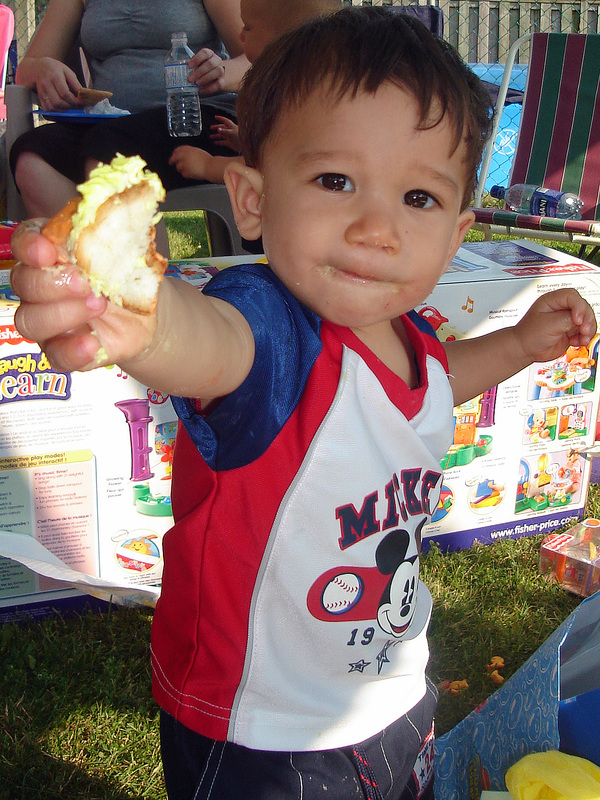 Here is my son touching, tasting, and sharing his very first birthday cake! The first instinct of a Toddler is to touch! The second instinct of a toddler is to put it in his mouth! And so began my journey to learn and do cakes for the ones I love 🙂 And as I grew as a baker, I had a couple awesome ups, and some disastrous downs, and little bit of stress, and a lot of fun! I can’t wait to share my adventures, what I’ve learned, and some of my first hand reviews of what’s out there for us “Cakers”. I haven’t learned it all yet though! So I’ll be inviting some amazing cakers to interview here on caketips.ca and see what’s going on behind the scenes of their amazing Cake Creations! Pokemon Charmander for Aiden’s 10th Birthday, my new favourite cake! Dare I share my cake fail on my blog? Aiden’s 9th birthday, a Minecraft Cake. Frozen Buttercream Transfer – First Attempt! Mario Cake for Aiden’s 7th Bday. If at first you don’t succeed… try again next birthday! My Thomas the Tank Engine cake story. The Happy Bookkeeper on Pokemon Charmander for Aiden’s 10th Birthday, my new favourite cake! Emily on Pokemon Charmander for Aiden’s 10th Birthday, my new favourite cake! Pokemon Charmander for Aiden’s 10th Birthday, my new favourite cake! | CakeTips.ca on Dare I share my cake fail on my blog? Aiden’s 9th birthday, a Minecraft Cake. Carmen Keeney on Pokemon Charmander for Aiden’s 10th Birthday, my new favourite cake!